List of Medical Colleges In Goa Total Govt. 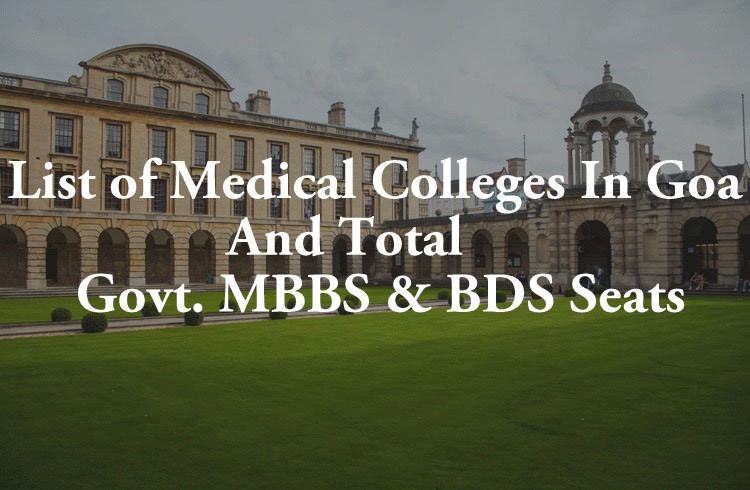 Private MBBS BDS Seats: There are few medical colleges in Goa state. Goa government will fill all MBBS and BDS courses seat through National Eligibility Entrance Test 2018’s counselling. The Central Board of Secondary Education and Medical Counseling Committee will publish the NEET Result 2018 and then Medical Counselling Committee will start the counselling procedure. Remember, MCC is only responsible for All India Quota counselling which will be conducted for 15% medical & dental seats. The notification of NEET 2018 counselling schedule on MCC’s official website. All candidates who will appear in NEET 2017 exam can take part in counselling. To know more about the counselling check out the below article. NEET UG Result 2018 will be announced in the month June 2018 on the official website of CBSE NEET. Candidates will be able to download their result and scorecard. After announcing the NEET result, CBSE will refer further procedures of NEET to Medical Counselling Committee (MCI) who is the official authority to conduct NEET Counselling for 15% reserved seats of All India Quota. Candidates are advised to keep checking this website for more latest updates on NEET UG Result & Counselling 2018. Goa Medical College, Panaji Goa University Govt. 1963 150 Recognized for 100 seats. Permitted for increase of seats from 100 to 150 u/s 10(A)for 2012-13. Pingback: DTE Goa NEET Merit List State Quota Rank 2018 Eligible Candidates For..